You all know the name, and you certainly know her music. Nicki Minaj may not be the first world-renowned female MC, but she sure as heck took the female rap game into the next stratosphere. In 2010, she became the first female solo artist to have seven singles simultaneously charting on the US Billboard Hot 100. According to Billboard, she has the most Hot 100 entries in history amongst female rappers, and also has the third-most entries amongst women of all genres. Nicki was the first female artist included on MTV’s Annual Hottest MC List, and the New York Times once described her as “the most influential female rapper of all time”. She has sold 20 million singles as a lead artist, and 60 million singles as a featured artist worldwide. Because of her presence, straddling the hip hop, rap and pop music genres, other artists like Iggy Azalea have basked in the path she has blazed in the mainstream. So when we quoted Marie Claire magazine in our headline, the November issue cover on which she appears, it’s certainly no exaggeration. 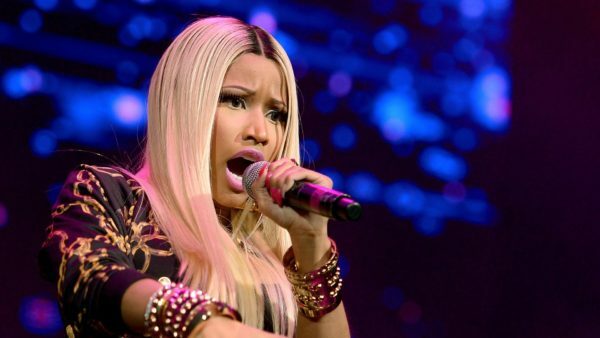 We are equally impressed with how Nicki uses her voice off-stage and outside the vocal booth. She has not shied away from controversial aesthetics or statements, but if you scratch a little deeper than the surface tabloid, click-bait articles, you will get to know a hard-working, intelligent, and incredibly talented woman whose perspectives on a number of topics have made us count her as one of the strongest feminist voices in music today. She has called out the double standards placed on women versus men in the industry, as well as the hypocritical outcry over her infamous ‘Anaconda’ cover photo despite the many similar images pasted all over men’s magazines and other media of women but of a different skin color. As a woman who is an industry leader, she has also been outspoken about equal pay and why she doesn’t like being categorized as a “female rapper” because men aren’t described as “male rappers”. 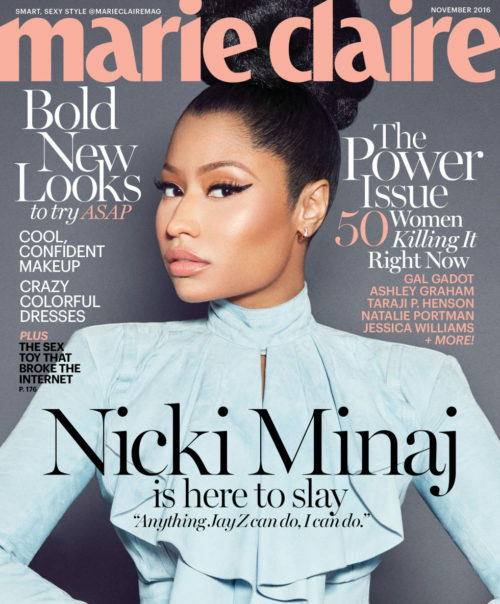 Nicki spoke to Janet Mock for her Marie Claire cover interview, touching on some hot-button issues in society right now. When asked about the epidemic of police shootings of black men and women, Nicki says there needs to be an equal amount of attention paid to the black women who are left behind when family members are killed. “We tend to not remember the black women who are mourning these men and who are thinking, ‘Oh, my God, what am I going to tell my child now about where his father is’, and the struggle it is for black women to then move on after they lose their husband or their boyfriend … The strong women in these inner cities often go unnoticed … no one really ever puts a hand out to them,” she said. During the recent presidential election, the Mothers of the Movement (some of whom are the mothers of Sandra Bland, Trayvon Martin, Michael Brown and Eric Garner) campaigned for and alongside Hillary Clinton throughout her campaign, raising awareness about the need to support families who experience racism and brutality. They also advocated for the importance of implementing policies that empower communities of color, who experience poverty and violence at higher rates due to institutional discrimination. When it comes to racism, Nicki says it happens within the entertainment industry also. “When Kim Kardashian’s naked picture came out, [Sharon Osbourne] praised it, and my fans attacked her for being such a hypocrite. So it wasn’t trashy and raunchy when a white woman did it, but it was when a black woman did it? It’s quite pathetic and sad, but that is my reality, and I’ve gotten accustomed to just shutting it down,” she said. Despite her public feuds with other women, most notably with Miley Cyrus at the 2015 MTV VMAs, Nicki insists she wants to set a good example for younger women, especially when it comes to business matters. Similar to Ronda Rousey’s bold “don’t be a do-nothing b*tch” comment, Nicki believes women shouldn’t rely on men for money. “Nowadays, I feel like [young women] see marrying into money—I think that’s a big thing now. I don’t want that to be a woman’s goal in life. I want your goal in life to be to become an entrepreneur, a rich woman, a career-driven woman. You have to be able to know that you need no man on this planet at all, period, and he should feel that, because when a man feels that you need him, he acts differently,” she said. Some may see this is an anti-family/relationship statement but it is not. Instead it is a reminder that while marriage, babies and relationships are beautiful and important aspects of life, they are not the measuring stick. It’s one of the reasons Nicki is trying to demolish the gender parameters placed on her career achievements, and make it about the music. She points to the way Jay-Z is lauded by the industry and fans and wonders where the female equivalents are. “He did such a great job being an authentic street guy and a businessman, and I was like, ‘Why aren’t there women doing that, taking the success from rap and channeling it into their empire?’ I felt like anything he could do, I could do.” she said. If there is one woman who CAN match Jay-Z, it is Nicki Minaj. And in mainstream pop, Jay’s own wife is a testament to the type of women who are leading the way, setting records and taking names. Nicki has collaborated with Beyonce in the past (feminist hip hop dream team!!) and says the fact that it becomes an excuse for girl power is why she’d work with Queen Bey again. “Every time Bey and I do something together, I see how women are inspired, and it has nothing to do with how we look. It has to do with how we are owning who we are and telling other women you should be the boss of your own career and the brains behind your life or your decisions or your art. I just love that feeling,” she said.